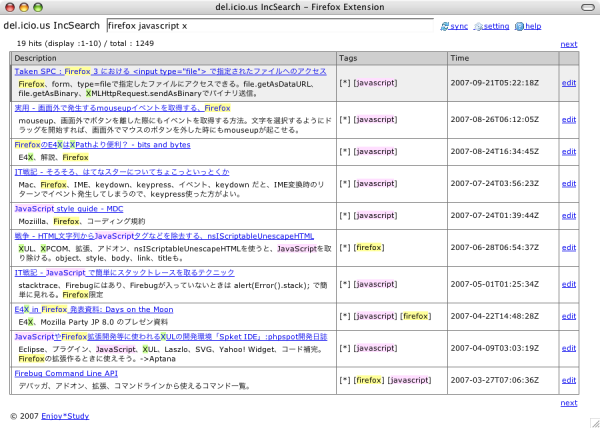 This extension is a incremental search UI for del.icio.us(http://del.icio.us/), You can find bookmarks very quickly. del.icio.us IncSearch was chosen as a runner up on Extend Firefox 2 contest. Incremental search from title, notes, tags for del.icio.us(http://del.icio.us/) bookmarks. Match bookmarks show list and match keywords highlight. Bookmarks load from del.icio.us(http://del.icio.us) are stored in your local computer for quick loading later. After installation, Firefox menu, "Tools" -> "del.icio.us IncSearch" selected, the search screen. The first is del.icio.us bookmarks and the synchronization is held. Authentication dialog box appears, please authentication. Since the "sync" link to hold down by the bookmark synchronization is performed. Initial state, the following is based on the comments remove (the second line and the last line to delete) and the number of del.icio.us saved count. The above changes have IncSearch class content, please refer. Firefox's profile folder under delicious_incsearch folder "user.css" the external css file will be created. The css file provided by the screen design changes to your likings.